NEW YORK—There’s a theory that the universe we live in exists side by side with a myriad of other universes, where the people and circumstances are all slightly different from the reality we personally inhabit. 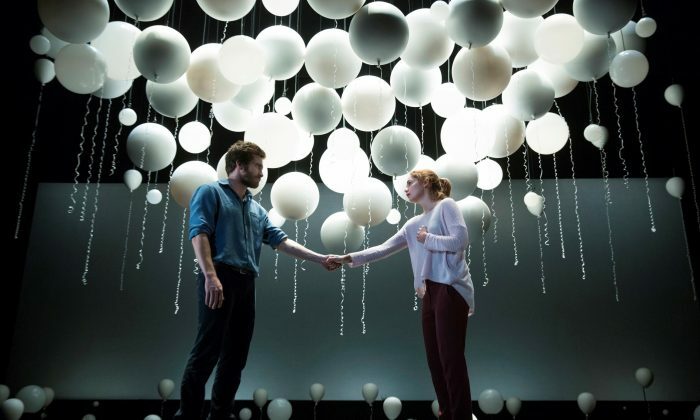 Playwright Nick Payne presents a very intriguing take on such possibilities in his work “Constellations,” now on Broadway at the Samuel J. Friedman Theatre. The story focuses on Roland (Jake Gyllenhaal) and Marianne (Ruth Wilson), their initial chance meeting at a neighborhood barbecue, and the development of things thereafter or lack thereof. Roland is already in a relationship or just getting over one and not yet ready to re-enter the dating scene in some of the realities presented. The switch from one universe to the next is done via lighting changes and the partial repeating of what was just said, while showing as many as six different versions of the same encounter. Sometimes additional dialogue is included so as to take the situation one step further than seen before. Sadly, ‘Constellations’ soon reveals itself to be more of a writing and an acting exercise than an actual play. Following the idea of “if only things were different,” “Constellations” shows these two characters as they begin a relationship, only to have it later threaten to come apart and then hopefully resume under different circumstances. The two attempt to start over, even while battling personal demons and illness. One particular scene in this regard has only a so-so effect when presented early on, but registers a much more powerful impact when done again later, after the audience has had a chance to build rapport with these individuals. It helps in the differentiating of things that both Roland and Marianne alternate as the betrayer and betrayed at different points in the various stories. Sadly, however, “Constellations” soon reveals itself to be more of a writing and an acting exercise than an actual play of substance. While there is a beginning, middle, and end to the work, things get repetitive rather quickly with all the changing from one reality to another. Ironically, there’s also a significant problem with the stronger moments in the show. The shifting to various universes forces the audience to get into the flow of a new scenario while still wondering about the one that’s just occurred. The result is the emotional connection that had been previously established is abruptly cut off in the transition. Fortunately, there is still is a lot to like here, especially in the terrific performances by Wilson and Gyllenhaal, both making their Broadway debuts. One sequence nicely demonstrates their chemistry. After an enjoyable first date, Roland is obviously interested in taking things further, while Marianne begins to have second thoughts. She doesn’t quite give the reason for her decision—at least at first. The situation is played here for a humorous effect. Another theme continually played out is how opposites attract. On the surface, the two have nothing in common. Roland is a beekeeper, while Marianne is involved in quantum cosmology. Her explanation of different universes and possibilities is the one time the concept behind the play is directly explored. The rest of the time, it’s up to the audience to understand what’s going on. At the same time, one can’t help but notice certain similarities that continue with the characters all the way through, no matter the reality. Passionate people both, Marianne is more of an instigator with a deep need to always be in control, while Roland is more laid back and accommodating; yet in his own way, just as complex as Marianne. Also helping tremendously here is Michael Longhurst’s very able direction, keeping the action moving smoothly and making each scene seem just different enough to take on a life of its own. Yet there’s no getting away from the continuous repetitiveness of all the switches, which eventually become distracting. It’s as if someone hit the reset button a few too many times. Tom Scutt’s set, basically a bare stage with a lot of large white balloons overhead, works well. Lighting by Lee Curran is sharp and distinct, and sound design by David McSeveney and original music by Simon Slater help add to the atmosphere of the story. “Constellations” presents a very interesting scenario, quite a number of them actually, and a strong creative team more than able to bring it to fruition. Yet when all is said and done, the show is missing a solid center with which one can truly connect. It’s kind of like eating a ton of delicious appetizers without any main course in sight. Still and all, it is at times a rewarding experience.